Two weeks ago, Thomas Brown of Thomas Vision Reef reported unconfirmed test results showing that “one of the top three frozen fish foods” had dangerously high concentrations of mercury in it. According to Brown, “estimated mercury levels exceeded 20 mg per gram of product” in the food in question. Twenty milligrams per gram is equal to 20,000 parts per million (ppm), a dangerously high concentration of mercury 20,000 times the FDA action level of 1.0 ppm. While the results Brown reported were almost immediately called into question and then subsequently dismissed after a thorough investigation by CORAL Magazine, at least one frozen fish food manufacturer was concerned enough that they elected to send their food out for testing by an accredited laboratory. The results of that first test are now back, and, as expected, the concentration of mercury in that food, as well as two similar foods on the market, is exceedingly low. “When we learned of this proposed ‘mercury scare,’” says Larry DuPont of LRS Foods, LLC., “we immediately submitted samples of our flagship Reef Frenzy food, as well as two other ‘complete’ blended foods, for mercury testing to erase any concerns about the safety of these products.” The two other blended foods DuPont sent to the lab were Rod’s Fish Only Blend and Rogger’s Complete Blend. LRS foods, which is one of three companies that dominate what DuPont calls the “boutique” frozen fish food market in the U.S., produces several food products for marine aquarium fishes, corals and other invertebrates. DuPont began producing small batches of fish food in 2012 primarily using local seafood. The company rapidly achieved regional success and then began to grow in reputation and nationwide sales. In 2014, at the Marine Aquarium Conference of North America (MACNA), it was announced that LRS foods were the “preferred diet” for the Genicanthus personatus breeding project undertaken by Hawaii-based biologist Karen Brittain. The announcement that the aquacutured angelfish selling for $20,000 each were raised on Reef Frenzy brought international notoriety to the North Carolina-based company. While Brown never publicly identified LRS foods as the frozen fish food he reported contained extraordinarily high levels of mercury, CORAL Magazine obtained documents that appear to identify Reef Frenzy as the food in question. In one of the documents containing the 20 mg per gram of mercury result, the subject line clearly reads, “Reef Frenzy Analysis Report.” Brown declined to comment on the laboratory findings. While these test results have yet to be replicated, they clearly show what most people familiar with mercury concentrations in seafood expected—Reef Frenzy, as well as two other similar frozen fish foods, contains low concentrations of mercury that are nowhere near the level Brown reported. In certified results from Advanced Laboratories, Inc., LRS Reef Frenzy was found to have a concentration of 0.032 ppm of mercury (wet weight)—well below the 20,000 ppm Brown reported. Brown claimed, “the levels of mercury in the food in question were…way past FDA regulations for human consumption.” In reality, the levels of mercury found in the LRS Reef Frenzy frozen fish food sample tested are below canned light tuna, which has a mean mercury concentration of 0.128 ppm according to an FDA database cataloging mercury levels in commercial fishes and shellfish. Like the lab report, the FDA also reports on a wet weight basis, so the fish food lab results can be compared with the FDA data. The FDA’s action level for mercury in fish is currently 1.0 ppm. Certified results for mercury levels in LRS Reef Frenzy, from Advanced Laboratories, Inc. In addition to LRS Reef Frenzy, Advanced Laboratories, Inc. tested a sample of Rod’s Fish Only Blend and Rogger’s Complete Blend. Rod’s food came back with a mercury concentration of 0.015 ppm, and Rogger’s food showed a mercury concentration of 0.011 ppm. The Rod’s Fish Only Blend and Rogger’s Complete Blend were purchased from Doctors Foster and Smith and shipped to LRS Foods in North Carolina. DuPont placed samples of each food in food grade, four-mil poly bags, and the foods were then shipped to Advanced Laboratories’ Utah laboratory, where the testing took place. 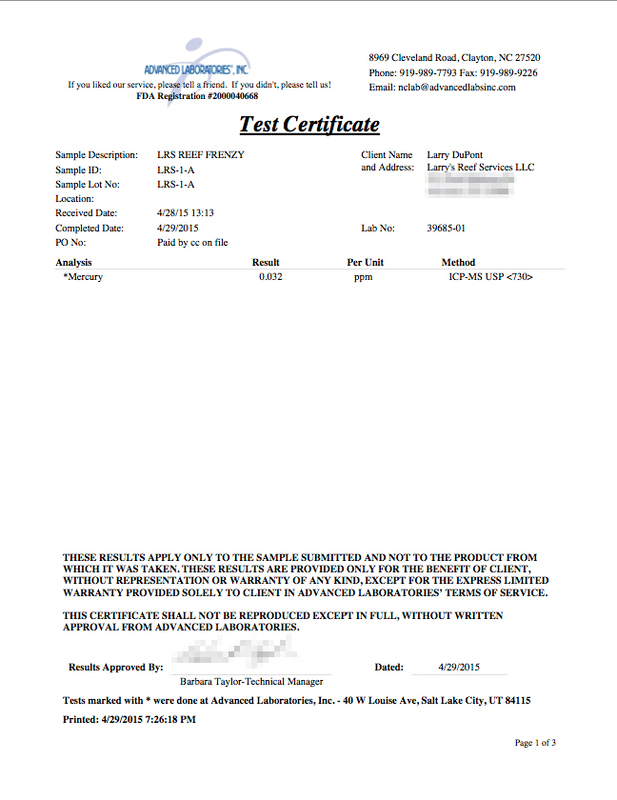 LRS LLC paid for the testing. The test results were independently confirmed by phone with a spokesperson for Advanced Laboratories, Inc., after reviewing electronic copies of signed and dated Test Certificates. Advanced Laboratories, Inc., is an accredited lab with the abilities to measure mercury and other metals. The lab is registered with the FDA. Ongoing testing of these foods should yield similar results. Why is There Mercury in Frozen Fish Food? While the mercury concentrations in these frozen fish foods are very low even by human health standards, some people have suggested that any mercury should be avoided. The reality, however, is that aquarists should be skeptical of a frozen fish food that doesn’t contain low concentrations of mercury. Why? 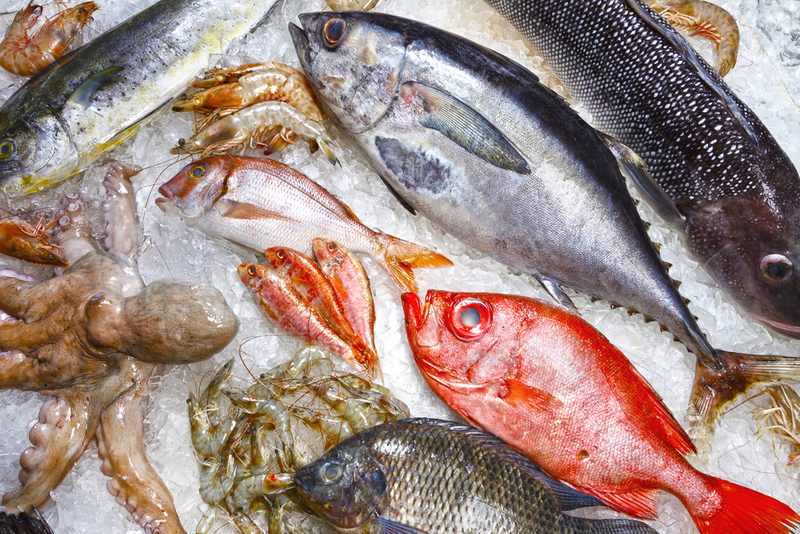 Mercury is present in virtually all seafood. If a fish food doesn’t contain mercury, it likely doesn’t contain seafood, and marine aquarium fishes benefit from marine-based foods. 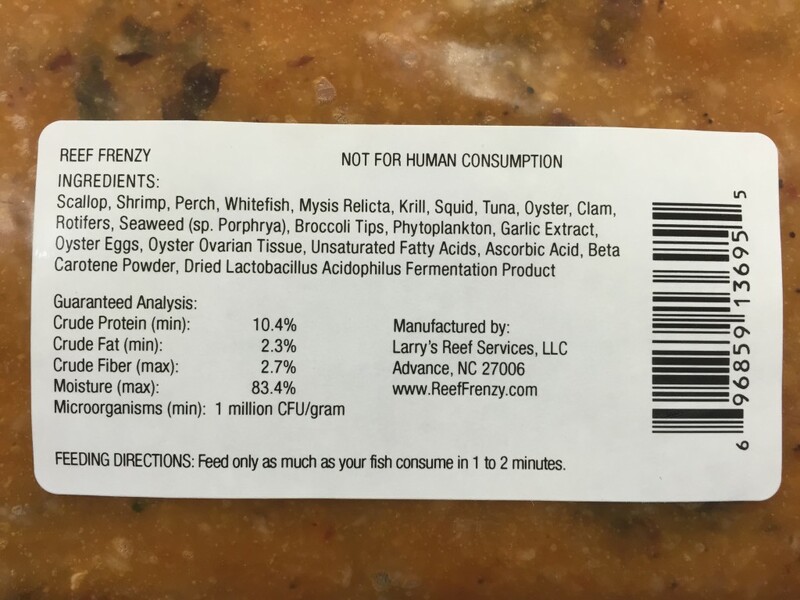 According to the Reef Frenzy label, most of the seafood in the product is seafood that has relatively low mercury concentrations. 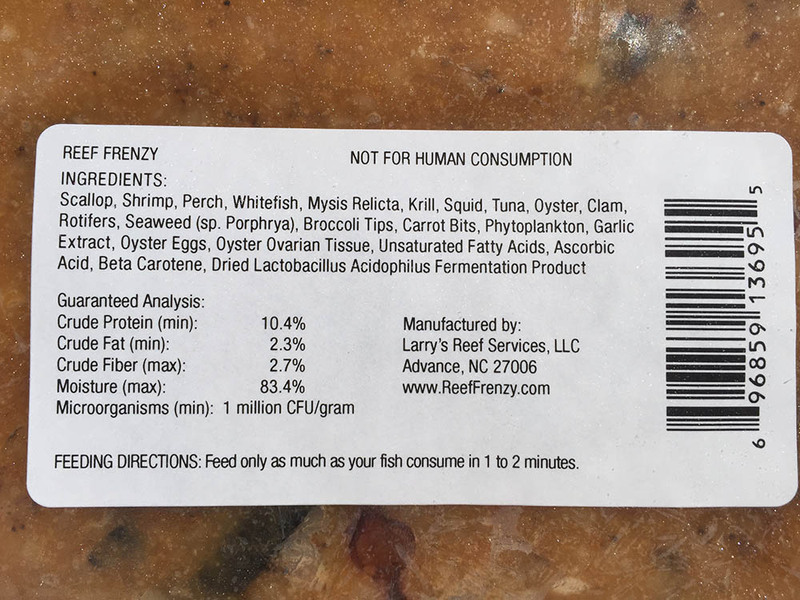 The ingredients on the label are organized by weight, as is common practice in labeling, and the first two ingredients are scallop and shrimp. According to the same FDA database referenced above, scallop and shrimp possess mean mercury concentrations of 0.003 ppm and 0.009 ppm respectively. The reason the Reef Frenzy test results show a mercury concentration of 0.032 despite the fact the food is primarily composed of low mercury seafood is likely because it contains ocean perch and small amounts of tuna. Ocean perch has a mean mercury concentration of 0.121, while tuna’s mean mercury concentration ranges from 0.128 to 0.689 depending on species. 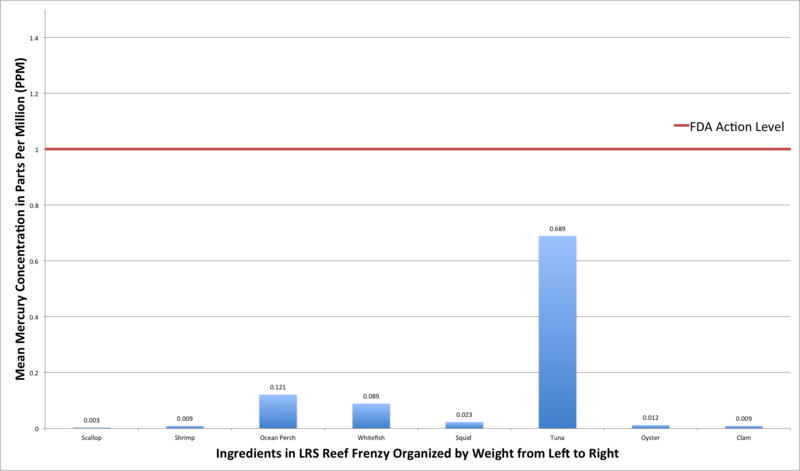 All of the ingredients in LRS Reef Frenzy have mean mercury concentrations well below the FDA action level, according to FDA data. Note: The mean mercury concentration shown in the graph for tuna is based on bigeye tuna, which has the highest mean concentration of mercury of all tuna listed in the FDA database. The tuna used in Reef Frenzy most likely has significantly less mercury. There are a number of studies looking at the effects of mercury on fish health. Many wild marine fishes consume far more seafood than humans do, and as such, are exposed to far higher mercury levels. Using the FDA threshold for mercury in seafood when considering fish health secondary to mercury consumption is therefore largely inappropriate. Having said that, the mercury concentrations found in the three foods tested is so low that it would not be considered to pose a significant risk to humans. In fact, based on the Environmental Protection Agency’s reference dose (RfD) for methylmercury (the organic form of mercury most common in seafood), a 154-pound individual could eat a 6-ounce serving of Reef Frenzy every day of the week and still stay below the RfD for methylmercury. At these levels, the health benefits far outweigh the risks. Published studies in the scientific literature show the possibility of sublethal effects from wild fishes consuming prey with concentrations of mercury well above the levels shown in the test results above. For example, one study shows elevated mercury concentrations far above the mercury concentrations in any of the frozen fish foods tested may affect prey capture efficiency and cause reduced predator avoidance capabilities. Of course these are challenges with which most aquarium fishes are not faced even if they were exposed to the level of mercury to which wild fishes in the study were exposed. Quality frozen fish food containing fresh seafood is one of the best foods available to marine aquarists. The test results reported above provide further evidence to debunk Brown’s extraordinary claims of high mercury concentrations in at least one popular frozen fish food. At the levels reported in the Advanced Laboratories, Inc., tests reported above, aquarists can be confident that feeding these foods will benefit their fishes despite the low concentrations of mercury present. *Update, 5-6-2015: An earlier version of this article included an image of an older LRS Reef Frenzy ingredient label, which includes “carrot bits” as an ingredient. LRS says “carrot bits” were dropped from the product when the company began using beta carotene powder. This article was updated with an image of newer label that is identical to the one in the original article except for the “carrot bits.” The original image can be seen here. The lab reports are a prerequisite for a lawsuit. Doctor Eco Systems has had theirs tested before they even started selling their products. Not just for Mercury but all toxins. They’ve had their full lab accredited results posted on their website since day one. Doctor Eco Systems has had theirs tested before they even started selling their products. Not just for Mercury but all toxins. They've had their full lab accredited results posted on their website since day one.